Background There is limited knowledge about key injury risk factors in alpine ski racing, particularly for World Cup (WC) athletes. Objective This study was undertaken to compile and explore perceived intrinsic and extrinsic risk factors for severe injuries in WC alpine ski racing. Methods Qualitative study. Interviews were conducted with 61 expert stakeholders of the WC ski racing community. Experts’ statements were collected, paraphrased and loaded into a database with inductively derived risk factor categories (Risk Factor Analysis). At the end of the interviews, experts were asked to name those risk factors they believed to have a high potential impact on injury risk and to rank them according to their priority of impact (Risk Factor Rating). Results In total, 32 perceived risk factors categories were derived from the interviews within the basic categories Athlete, Course, Equipment and Snow. Regarding their perceived impact on injury risk, the experts’ top five categories were: system ski, binding, plate and boot; changing snow conditions; physical aspects of the athletes; speed and course setting aspects and speed in general. Conclusions Severe injuries in WC alpine ski racing can have various causes. This study compiled a list of perceived intrinsic and extrinsic risk factors and explored those factors with the highest believed impact on injury risk. Hence, by using more detailed hypotheses derived from this explorative study, further studies should verify the plausibility of these factors as true risk factors for severe injuries in WC alpine ski racing. Recently, significant changes to many aspects of WC ski racing have occurred; the introduction of carving skis and water-injected slopes being two of the most prominent.15 ,16 As a consequence of these changes, the course settings and the athlete's technique and physical preparation changed as well.17–19 These numerous changes have added to the complexity of the injury problem. This makes it difficult to determine the key risk factors for severe injuries based on retrospective study designs. Moreover, prospective designs are currently limited by the lack of detailed hypotheses about potential key risk factors. Therefore, a qualitative interview approach with expert stakeholders of the WC ski racing community was chosen for this study. The aim of this explorative study is to compile a list of perceived intrinsic and extrinsic risk factors for severe injuries in alpine WC ski racing. Furthermore, it is to derive precise qualitative statements about those factors that are thought to have the highest impact on injury risk in order to provide more detailed hypotheses for further studies. The analysis involved individual interviews with representatives from different expert stakeholder groups (table 1). The participation on the study was voluntary. The sampling was chosen based on the principle of maximal variation of perspectives and was enlarged as long as new perspectives were obtained.20 However, compared to WC coaches, WC athletes, males in particular, demonstrated lower interest for participating in the interview process. Therefore, the gender-specific perspectives were unbalanced within the expert group ‘WC athletes’ (female: n=7, male: n=4). In the first part of the interview (Risk Factor Analysis—RFA), general, detailed and specific questions were posed regarding whether they saw any noticeable problems or distinct features that are related to severe injuries (>28 days of absence as defined by Fuller et al23). The general section was left open to allow the interviewee the opportunity to address any area they considered to be problematic. Circular questioning was used to draw out as many ideas from the interviewees as possible with minimal influence from the interviewer.20 Each basic category (Equipment, Course Setting, Snow and Athlete) not mentioned by the interviewee in the general section was asked in the detailed section. For the specific section, a checklist with perceived risk factors was used by the interviewer to keep track of the topics covered. Any topic from this checklist not mentioned during previous questioning was asked in this section. This checklist with perceived risk factors was established through trial interviews with coaches, athletes and research team members, and was dynamically enhanced throughout the data collection process based on the interviews previously conducted.20 In the second part of the interview (Risk Factor Rating—RFR), participants were asked to name and rank, out of all the perceived injury risk factors discussed in the interview, the factors they believed had high potential impacts on the risk of severe injuries. For the RFR section of the interview, in principal, the same data processing as for the RFA section was performed (audio file → transcription → paraphrasing) and paraphrased statements were entered into categories of the same name. For this analysis all 61 interviews were considered. In the RFR section, the interviewees were asked to select, out of all mentioned risk factors, the ones with high potential impact on injury risk, and to rank them in order of their perceived priority. All interviewees identified between one and six risk factors believed to have high impact on injury risk, whereby the majority named two or three factors. Depending on which impact on injury risk the interviewee assigned each perceived key risk factor, a ranking number was given to each statement. A lower ranking number means a higher potential impact of the risk factor, with ranking number ‘1’ given to the highest impact. For each perceived key risk factor that was named in the RFR section, the frequency of mention and the mean of the rank numbers given by the experts were analysed. Then, a rank order for the frequency of mention and a rank order of the assigned mean rankings were created. Finally, based on the sum of these two rank orders, an overall ranking list of perceived key injury risk factors was defined. The experts’ perceived injury risk factor categories are presented in alphabetic order in table 3. Within the basic categories Athlete, Course, Equipment and Snow, a total of 32 risk factor categories were inductively derived from the qualitative analysis of the interviews. The experts’ priorities of perceived key injury risk factor categories regarding their potential impact on injury risk are presented in table 4. 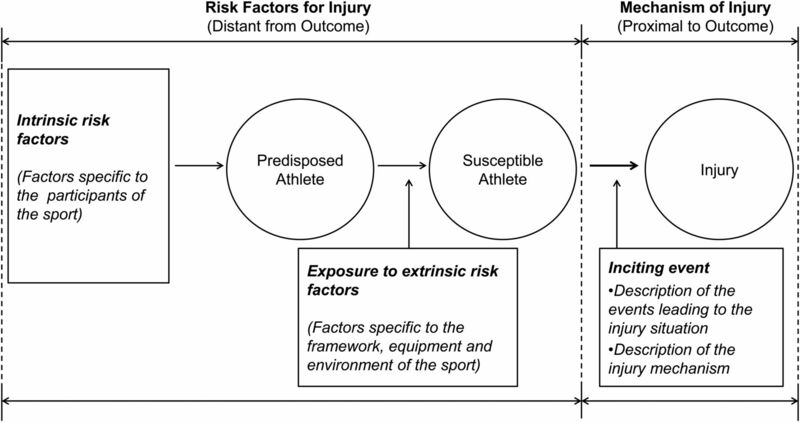 A total of 25 risk factors categories were suggested to play a key role for injury causation. Owing to space restrictions in this article, the results of the qualitative content analysis are only presented for the experts’ top five key injury risk factors. An overview of the corresponding quote categories and example quotes are given in table 5. This study was undertaken to compile and explore perceived intrinsic and extrinsic injury risk factors for severe injuries in WC alpine ski racing. The inductively derived risk factor categories were presented in table 3. This list may serve as a guideline for further studies. Regarding their perceived impact on injury risk, the experts’ top five risk factor categories were: system of ski, binding, plate and boot; changing snow conditions; speed and course setting aspects; physical aspects; and, speed in general. Owing to space restrictions in this article, only these five risk factor categories are discussed in depth. In the following synopsis, the experts’ direct quotes are highlighted with quote signs and italic font. According to the experts, a superior fitness level is one of the most important perceived factors for injury prevention “Physically weak athletes have a higher risk for injuries.” Even though the importance of a superior fitness level for injury prevention is widely accepted in practice, no definite conclusions can be made based on the existing literature.28 However, fatigue is known to have a negative impact on balance control,29 and physical fitness has an effect on reaction time during exercise.30 Therefore, it seems to be reasonable that a lack of fitness and early fatigue could be risk factors for injuries. According to the experts, there are actually two main problems in alpine WC ski racing regarding ‘physical aspects’ of the athletes: (1) the fitness level of today's top athletes reaches physical limitation and cannot be further improved in order to resist the outer forces and (2) younger athletes, in particular women, are not always sufficiently prepared to enter the WC. According to the experts, high skiing speed is a general perceived risk factor for injuries, in particular, if speed is constantly high. They argue that this deceives the senses and results in a loss of concentration. In addition, the athlete may have too little time to react and/or correct if an injury situation develops rapidly at high skiing speeds.7 ,15 High skiing speeds mean high kinetic energy and, as a result, can induce serious injuries in the event of a quick energy conversion during injury events or crashes “…technical mistakes do not have as fatal consequences at lower speed.” Therefore, some experts think that speed in general should be reduced. The qualitative approach used in this study contributes to the theoretical and conceptual body of knowledge and adds new perspectives regarding perceived injury risk factors in alpine ski racing. However, there are some dangers/limitations related to the study design used. First, the applied study design does not allow for verification of whether the perceived injury risk factors are true risk factors. These factors primarily need to be validated against formal aetiological studies in order to confirm their status as injury risk factors. Second, the quality of results depends on the quality of the interviews, as well as on the expertise and degree of reflection of the interviewees. Therefore, it was attempted to provide a comfortable environment in which to conduct the interviews, and each individual interview started with an open-ended question in order to encourage the interviewee to speak freely.20 In order to maximise the richness of data, the sample was chosen in an attempt to maximise the variation of expertise and perspectives.20 However, due to the voluntary character of this study, some limitations remain with respect to an unbalanced sampling, especially, for the quantitative analysis of the interviews. Third, the qualitative interview approach includes the danger of subjectivity. Therefore, three different researchers were involved in conducting and analysing the interviews: (1) the first five interviews were conducted and processed by all three researchers together and (2) for all interviews, the classification of the paraphrased statements into risk factor categories was performed by all researchers together in a permanent exchange of perspectives. Fourth, the results were not stratified by discipline. This may limit the representation of the findings for specific disciplines since the perceived risk factors and, in particular, their perceived priority, may be different. As shown in this paper, injuries in WC alpine ski racing can have various intrinsic and extrinsic risk factors. In order to decrease injury rates in alpine ski racing effectively, a comprehensive perspective might be needed. It is conceivable that a change of one factor alone may not improve the injury problem substantially, and several risk factors have to be approached by prevention interventions. Nevertheless, not all risk factors have the same impact on injury risk. This study compiled and explored those perceived risk factors with the highest believed impact on injury risk. Hence, further studies should verify the plausibility of these factors as true risk factors by using more detailed hypotheses derived from this explorative study. This study compiles a list of perceived intrinsic and extrinsic injury risk factors for severe injuries in World Cup alpine ski racing. This list may serve as a guideline for further studies with respect to injuries in alpine ski racing. This study explores those perceived risk factors with the highest believed impact on injury risk. With its qualitative character, it provides a base for more detailed hypotheses for further aetiological studies in alpine ski racing. We thank all the athletes and coaches, the ski industry, organisers, officials and topic-specific experts for their cooperation and their contributions.
. Injuries among male and female World Cup alpine skiers. Br J Sports Med 2009;43:973–8. doi:10.1136/bjsm.2009.068759.
. Completion rates and injuries in alpine races during the 1994 Olympic Winter Games. Scand J Med Sci Sports 1996;6:287–90.
. The incidence of anterior cruciate ligament injuries among competitive Alpine skiers: a 25-year investigation. Am J Sports Med 2007;35:1070–4. doi:10.1177/0363546507301083.
. Return to play guidelines after anterior cruciate ligament surgery. Br J Sports Med 2005;39:127–31. doi:10.1136/bjsm.2004.010900.
. Understanding injury mechanisms: a key component of preventing injuries in sport. Br J Sports Med 2005;39:324–9. doi:10.1136/bjsm.2005.018341.
. Assessing causation in sport injury: a mulitfactorial model. Clin J Sport Med 1994;4:166–70.
. Mechanisms of anterior cruciate ligament injury in World Cup alpine skiing: a systematic video analysis of 20 cases. Am J Sports Med 2011;39:1421–9. doi:10.1177/0363546511405147.
. Aggressive quadriceps loading can induce noncontact anterior cruciate ligament injury. Am J Sports Med 2004;32:477–83. doi:10.1177/0363546503258928.
. Biomechanical analysis of anterior cruciate ligament injury mechanisms: three-dimensional motion reconstruction from video sequences. Scand J Med Sci Sports 2007;17:508–19. doi:10.1111/j.1600-0838.2006.00558.x.
. Events leading to anterior cruciate ligament injury in World Cup Alpine Skiing: a systematic video analysis of 20 cases. Br J Sports Med 2011;45:1294–302. doi:10.1136/bjsports-2011-090517.
. Skiing injuries. Am J Sports Med 1999;27:381–9.
. Epidemiology and risk factors of humerus fractures among skiers and snowboarders. Am J Sports Med 2008;36:1880–8. doi:10.1177/0363546508318195.
. Alpine ski and snowboarding traumatic injuries: incidence, injury patterns, and risk factors for 10 years. Am J Surg 2009;197:560–4. doi:10.1016/j.amjsurg.2008.12.016.
. Risk factors for injuries in alpine skiing, telemark skiing and snowboarding—case-control study. Br J Sports Med 2011;45:1303–9. doi:10.1136/bjsports-2011-090407.
. Preparation and maintenance of pistes—the handbook for practitioners. Davos: Swiss Federal Institute for Snow and Avalanche Research, 2002.
. Biomechanical aspects of new techniques in alpine skiing and ski-jumping. J Sports Sci 2003;21:679–92. doi:10.1080/0264041031000140284.
. Biomechanische Analyse der Carvingtechnik als Grundlage modifizierter Trainingsmethoden in der konditionellen Vorbereitung alpiner Ski- und Skrennläufer. Spectrum 2001;13(Suppl):91–7.
. The qualitative research interview. Med Educ 2006;40:314–21. doi:10.1111/j.1365-2929.2006.02418.x.
. The interview: from structered questions to negotiated text. In: Denzin NK, Lincoln YS. eds. Collecting and interpreting qualitative materials. Thousand Oaks, CA: Sage Publications, 2003.
. The qualitative interview in IS research: examining the craft. Info Organ 2007;17:2–26.
. Consensus statement on injury definitions and data collection procedures in studies of football (soccer) injuries. Br J Sports Med 2006;40:193–201. doi:10.1136/bjsm.2005.025270.
. A model for the turning snow ski. Int J of Mech Sci 1989;31:721–36.
. Effects of ski stiffness in a sequence of ski turns. In: Müller E, Lindinger S, Stöggl T. eds. Science and skiing IV. Maidenhead: Meyer & Meyer Sport (UK) Ltd., 2009.
. Risk factors for lower extremity injury: a review of the literature. Br J Sports Med 2003;37:13–29.
. The effects of moderate fatigue on dynamic balance control and attentional demands. J Neuroeng Rehabil 2006;3:22. doi:10.1186/1743-0003-3-22.
. Influence of physical exercise on simple reaction time: effect of physical fitness. Percept Mot Skills 1997;85(Pt 1):1019–27. Funding This study was financially supported by the International Ski Federation Injury Surveillance System. The funding source had no involvement in the study design, in the collection, analysis and interpretation data, in the writing of the report, or in the decision to submit this paper for publication. Ethical approval This study was approved by the Ethics Committee of the Department of Sport Science and Kinesiology at the University of Salzburg. Data sharing statement Additional data from the digital database of the Risk Factor Analysis (RFA) of this study was presented in the unpublished ‘FIS report 2010’ to the International Ski Federation.